Truform Compression Arm Sleeves offer durable material construction and superb wearing comfort to alleviate symptoms of lymphatic inflammation in the arms. 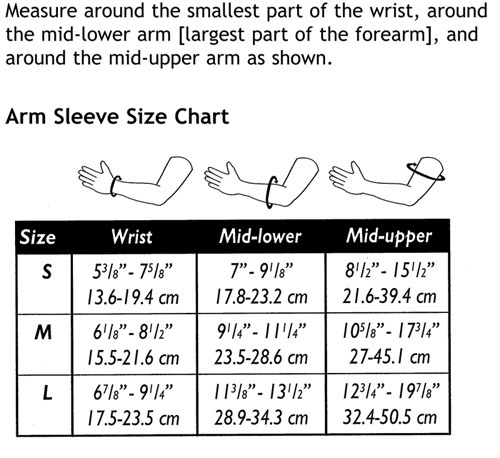 These Lymphedema Sleeves include a specialized silicone band at the top of the sleeve. Small silicone dots on the inside of the band gently adhere to the arm and provide extra security to keep the sleeve in place during wear. Truform lymphedema sleeves eliminate excess heat from the arm, thanks to their breathable microfiber fabric. The material also allows for easy donning and removal and gives the sleeve a soft texture. This lymphedema compression sleeve administers 15-20 mmHg of graduated Compression Therapy pressure. Doctors recommend compression therapy for patients who have recently undergone arm surgery, radiation therapy or who have experienced trauma to the arm. Graduated compression reduces inflammation of the lymph glands by helping the glands return lymphatic fluid to the bloodstream. This reduction in swelling also eases arm pain related to lymphedema. This sleeve is available in three sizes and does not contain any latex.